That's a distinction without a difference. US and America are interchangeable in the sense that there is no other country in the world whose name begins with United States of............and you commonly describe those who live in the USA as Americans not USies. So, no critique of the economics then? We've been over this territory before. You have said, and I accept, that you have no dislike toward Americans in general. You have also said, and I accept that you do have dislike toward what you regard as American imperialism. I'm fine with that also. Confusion arises at the margins when the lines between public and private sectors, individual and government are blurred. The only confusion and blurring is the confusion and blurring which you have endeavoured to create. You did not answer my question about your figures on the decline in relative value of the dollar. As that was a lynch pin in your argument, I will until that is clarified rely on the graphs, that show that the debt increase as presented by you as an innocent-looking long term average is not relevant to the hockey stick upwards trajectory of the last decade. The current bitcoin frenzy is an indication of weariness with the debt-laden dollar as a reserve currency and token of value. A few years back it was the Euro In time, an alternative will be found and the US will no longer be able to assume that ad lib printing is the answer to decline. What does not appear to have declined is the refreshing militancy of the American working class from which we could learn much on this side of the Atlantic. Last edited by C. Flower; 01-01-2014 at 07:03 AM. So, the US dollar is worth one sixth of what it was 40 years ago ? In relation to what - all foreign currencies ? Would there be a graph on that ? I used this University of Oregon calculator to arrive at the $1-$6-02 ratio. There are lots of alternative calculators out there. They may give different numbers I just don't know. If you had bothered to click the link you'd see that the information is self-explanatory, and provides a value in today's money for $1 for every year going back to the introduction of the $ in 1774. You asked for a graph, and I gave you a table, because 1: that was the source I used, and 2: it plots much more specifically a wider range of information than would be shown on a manageable sized graph. No-one is denying that the debt has mushroomed, or claiming that it is an ideal situation. What is at issue is it's effect on the US economy going forward. I contend not nearly as dire as doom wishers such as yourself. Your hockey stick analogy was correct at one point in time, but that point has passed, and like all hockey sticks at some point, yours too has come to be broken. If you had just read a little up thread you'd have seen that I already posted @ 161that the US deficit for FY 13, ended in September was less than half of what it was when Obama assumed office in 2009. The federal budget deficit will plummet to $642 billion this year, congressional budget analysts said Tuesday, reducing their previous forecast by roughly $200 billion. The CBO credited recovering tax revenues and an infusion of cash from mortgage giants Fannie Mae and Freddie Mac for the dramatic reduction, which puts the nation on track for its smallest deficits since the economic crisis hit in 2008. Moreover, the nonpartisan Congressional Budget Office predicts that the deficit will continue to shrink, falling below 3 percent of the overall economy by 2015, a level economists consider to be economically sustainable. While the CBO forecasts that deficits will begin rising again by the end of the decade as the baby boom generation taps into Social Security and Medicare, the sunnier outlook is calming Washington’s urgency in pushing for debt reduction. Using the same purchasing power parity method I showed that the decline in value of the Irish currencies was even more pronounced than that of the US. in 1970 you could buy 5 pints of Guinness for a pound, while today a Euro barely buys one fifth of a pint. 5 X 5 = 6? Anyone? Ireland is targeting a 4.8% deficit in 2014, and 3% in 2015. Moreover, the nonpartisan Congressional Budget Office predicts that the deficit will continue to shrink, falling below 3 percent of the overall economy by 2015, a level economists consider to be economically sustainable. Just the same as Ireland. You're fine, so. So, after having been shown to be wrong with your claim that I dd not answer your question, you are now unwilling to acknowledge that I did answer it. Difference is that the US and Ireland got to the same destination via very different routes. Ireland via austerity, US via stimulus, growth, and expansion, much easier. Thing is, if you now claim that Ireland has taken the hard medicine, turned the corner, got it's books in order etc. you cannot simultaneously claim the US is out of step. Employers added 217,000 jobs in May as the labor market reached a milestone with the recovery of all 8.7 million jobs lost in the recession. Unemployment now at lowest since 2008. 5 consecutive months of job creation above 200,000. Employment growth in first half of 2014 fastest since 1999. Dow closed above 17,000 for first time. U.S. JOBS GROWTH IN JUNE OUTPACES FORECASTS. The Bureau of Labor Statistics released the Employment Situation Report this morning, showing that employers added 288,000 jobs to nonfarm payrolls, improving on the 217,000 positions gained in May. Unemployment fell to 6.1 percent, from 6.3 percent the previous month. The figures appear to validate the position of economists and investors who took the lackluster first-quarter GDP numbers in stride, and remain optimistic about continued improvement in the domestic labor market. Hasn't fallen off a cliff, but the figures for the US economy are bad, bad, bad. January employment numbers out this morning. 150,000 net new jobs, 30,000 less than expected, but that's coming off 262,000 in December. Hourly wage rates up 2.5%. It's a good measure of how much the US economy has changed in the last 23 years, to note that the top 5 US companies by market cap today are now the big 5 tech companies, with a combined market cap of $2.7T, (growing fast), with an average age of 23 years, while 6-10 all of whom at some point or other placed in 1-5, currently have a combined cap of $1.6T (and growing slowly) with an average age of 123 years. The top five in Ireland are Diageo, CRH, AIB, BOI, and Glanbia, all old and/or old industry companies. It's estimated that at least 50% of US households have at least one person with an Amazon Prime membership. Radio Shack which used to have 11,000+ small stores is now down to less than 1,500. Macy's department stores which had 950 stores, now has 850, is headed to 700, and few believe it will stop there. 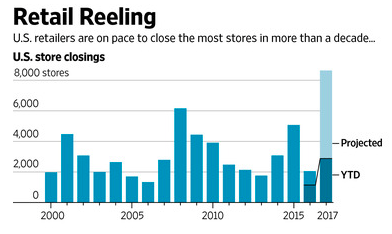 Based on the pace of store-closings so far this year, the brokerage Credit Suisse estimates that U.S. retailers will close more than 8,600 locations this year, which would eclipse the number of closings during the 2008 recession. The killer stat: "[C]losings have been announced for 2,880 retail locations this year, including hundreds of locations being shut by national chains such as Payless ShoeSource Inc. and RadioShack Corp. That is more than twice as many closings as announced during the same period last year." Lingo, for the land grab over the past three decades, icluding the influx of fast-fashion and off-price chains: "over-storing." How brick-and-mortar chains are coping: "In a bid to better compete with Amazon.com, [Walmart] has been scooping up e-commerce startups, including Jet.com and ModCloth. And just this past week, PetSmart Inc. bought Chewy.com, a fast-growing online rival." September's job losses are expected to be offset in future months by new activity generated by rebuilding. It was funny reading the first page of this thread again. I've generally avoided posting stock market/Wall St. news here, preferring to post only Main St. news on jobs etc. that better reflects the real economy. Brief departure and explanation today to put the matter in perspective. The Dow had its largest ever one day numerical drop today. 1175 points, 4.75%. Since it's all time high of 26,500 a couple of weeks ago, it's now down about 13%. Since Jan 2017 the Dow had risen 30%. A 10% drop is considered a "correction". A 20% drop is considered a "Bear" market. Ironically Wall St' troubles are partly the result of good news on Main St. announced on Friday. In addition to the 200K Jan jobs report, new information shows a real rise in wages. There are now fears that consumers with more money to spend, will trigger inflation, that in turn will cause the Feds to raise interest rates. Wages rose faster last year in more states than in any time in the last several years, according to a recent Reuters analysis, and a government report Friday showing hourly wages rose in January at their fastest pace in more than eight years. That, coupled with a need to clear some "froth" from the market is what this is about. I doubt if we are done with it yet. Trump has tried to own every point increase, so he's got to own the decrease too. Today was also the first day on the job for Janet Yellin's replacement Jerome Powell. Gov. Jerry Brown said yesterday that as few as 15,000 tax filers in the state provide one-quarter of all income taxes. The U.S. economy was above expectations in May and shored up a strong start in hiring for the year. The unemployment rate fell to 3.8 percent, the lowest since 2000.